This Tuesday October 24th is National Food Day, a time when we’re encouraged to “eat real.” To us, that means eating real food, yes – less processed and refined stuff, and more fresh fruits, vegetables, and the like. In the past, we’ve recognized some impressive local food champions, and hosted events like Funding Foodmakers and worked on productions like the Reel Food video series, we thought it appropriate to bring together something for our local eaters, and bring food day back home to y’all. How can you, the average conscientious eater, make a better food system for our diverse communities to enjoy? While food swaps have occurred in various forms in Long Beach and beyond, it’s not tough to start your own if you know the parameters you’d like. Some swaps include just-cooked, individually packaged foods, or jarred and preserved foods. Some swaps, like the North LB Crop Swap, are whole foods – fresh harvested fruits, vegetables, greens, and herbs. In any case, swaps typically consist of home-made and home-grown items. You could either have item-to-item exchanges, or a free-for all. Either way, there’s usually a bounty to be gained by everyone if you get enough people together. Buying organic produce, grains, and other foodstuff collectively can also be a great option when you’re trying to save money and buy in bulk. This is literally the simplest definition of a cooperative, and perhaps one of the most efficient for some items that you’ll need regularly. Okay, we know this first one is kind of obvious, so why is this section so darn long? Because it’s not easy to support local; it requires a lot of creativity in our choices. It’s not easy for many college students, low-income families, people experiencing homelessness, or even most middle-class residents to acquire conventional food to get through the month. We know that shopping at the farmers market isn’t going to change all that. But still, the way to make quality, local food more commonplace is to support it with our dollars when we can. Whether that means switching to a simpler, healthier bread that’s made in your neighborhood, ditching the plastic box of lettuce for a bag of mixed greens at the Sunday Farmers Market, or using a local artisan butcher for sausages in your holiday BBQ tradition, pick something that brings you joy. 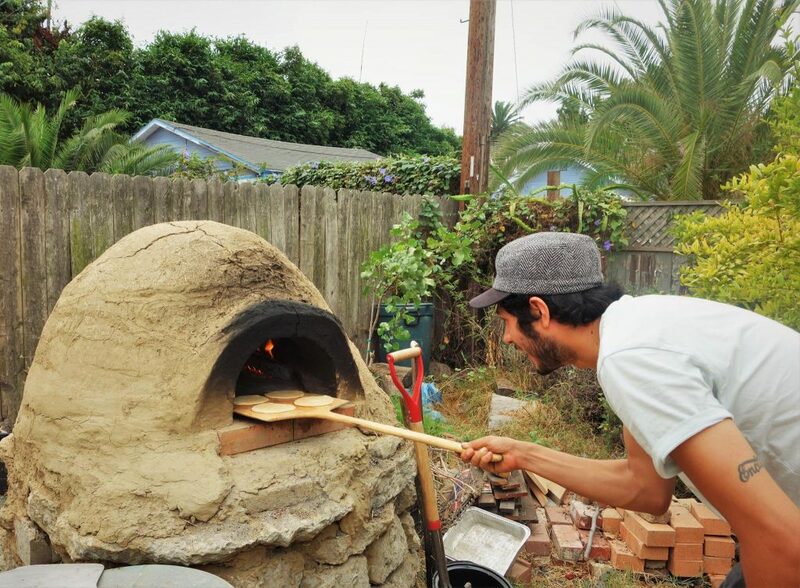 Arturo Enciso, a local breadmaker at Gusto. Sometimes, it means being inquisitive and curious when eating out or ordering food – you wouldn’t believe the places we learned support local SoCal farms that don’t even advertise it! The point is – sometimes, all it takes is a little shift in what we buy and who makes, to make us feel more connected to our food and more excited to prepare it. But what about that huge percentage of the population that can’t even afford basic, cheap food? You can support local food organizations that are helping to fill the gap, and find ways to share what you’ve got as well. Harvest Partners LB has a volunteer network that harvests people’s extra backyard produce and distributes it to local food banks, pantries, and shelters. They are currently recruiting and training harvest managers, raising funds for a new company truck, and are always seeking clients who need fruit harvested. We’ve also got Food Forward rescuing market produce in Long Beach, and Food Finders working regionally to help end hunger. And those farmers markets? 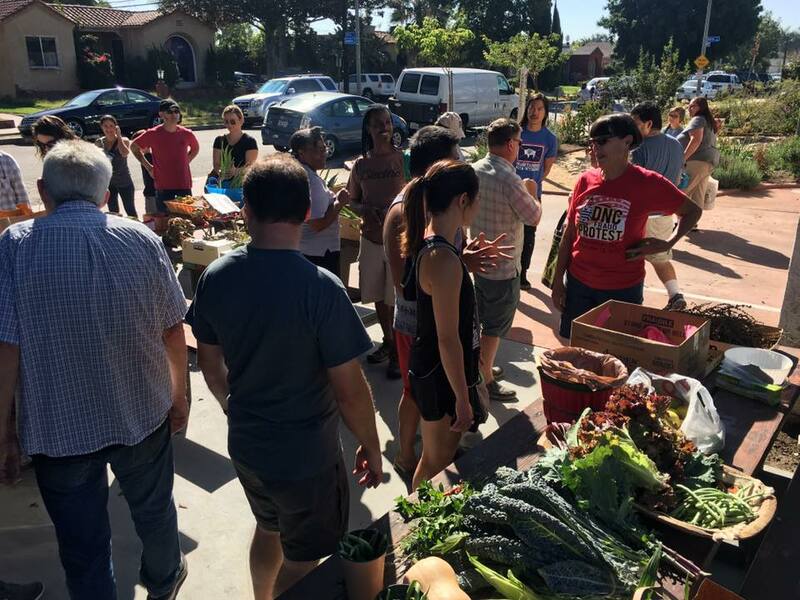 They’re actually part of the solution, too – with pioneers like Harbor Area Farmers Markets utilizing innovative nutrition incentive programs like Market Match to boost the purchasing power of shoppers who use S.N.A.P. (fka foodstamps). There are also some pretty consistently fresh-stocked, well-managed corner stores in Long Beach – contrary to popular belief, they’re not all liquor stores! We’ve got some great neighborhood markets that you’ll find in our Neighborhood Guides to North, West, and Central Long Beach. There’s also an exciting new campaign called the Healthy Market Partnership – encourage your best local neighborhood market to join to get more support in marketing, procurement, and educational pieces that help make the healthy choice the easy choice for shoppers. You can also buy shares in the Long Beach Grocery Cooperative now, as they’re building power to open a large market! Finally, reading labels in major supermarkets, and seeking California-grown and produced foods is also a good start to shift our thinking, while taking a peek at our Locavore Guide to choose a couple places to try out. For those who know local food oh-so-well, you can contact us to help us update our guide as we work toward an online, interactive map! 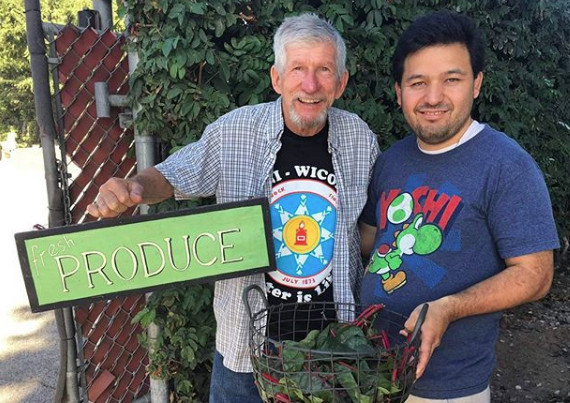 Luis and Phil at the North Long Beach Crop Swap. We celebrated a huge win for local food just this month as the city passed an ordinance to expand urban agriculture within the city. While the ordinance is designed to take advantage of a statewide program that focuses on a tax benefit for vacant lots, the city’s update to their zoning code sets a stronger foundation to proliferate community gardens and urban farms. These projects can actually create some modest income in communities that need it, health benefit when these projects sell to the community – but only if innovative people take the leap to start them! We’re here to support our seeders’ new projects, assist with your proposals, and help you find the right partnerships as the program goes online next month. Still, one of the best ways to create more supply of good food is to increase institutional commitment to support nutritious, ethically sourced food. In Los Angeles, they crafted the Good Food Purchasing pledge to do just that, and have seen a reduction in the cost and increase in quality and local procurement for the school food program, as well as companies like Google upping the ante and signing on as well. In Long Beach, we have some of the best hospitals in the nation, two major colleges, tons of huge conventions, and free meals for kids in the summer (not to mention a fairly busy jail, and our own airport and, oh yeah, the Port). We are a city made up of huge institutions, and these institutions feed us! If just a few of them adopted such a pledge, with a city commitment to spend its dollars well and make incremental changes, the local food system would start shaping up in a more viable, beneficial way. If we really want sustainable change, we’ve got to have a learning approach – sharing expertise and knowledge with one another! Whether it’s at one of Long Beach Time Exchange or The Children’s Clinic’s community-led cooking workshops, taking Master Gardener classes locally, or chatting with anyone who shows a vague interest eating healthier, we can all benefit from sharing what we know! Joining a community garden is also a nice way to learn by doing, and most networks offer their own classes and workshops for no additional charge. It’s why we created the Food Party (in a box) program – so that community groups and local experts can more easily find each other. You sign up; we help you connect through an interactive group learning experience. Long Beach also has more than a dozen gardens in schools, some of which could use more parent and community involvement to be successful! The possibilities are endless, not to mention awesome programs like Healthy Active Long Beach and the Long Beach Alliance for Food and Fitness. We created a Grow Food, Cook Food, Eat Food Guide in North Long Beach as part of our Kaiser Healzone grant – their Coalition for a Healthy North Long Beach is another great group to get involved in for change-making and learning. Last, we gotta give a shout out to MarketLovr – whose community learning projects are simply amazing – check out their Vegan Survival Guide! So, there it is. A bunch of ways, disguised as four, that you can support healthier, local food. Perhaps if we all find one small thing to do, we can transform our local food system for the better before next year’s National Food Day comes up on the calendar.